Recipe for a me-too, stale, pedestrian feature article on Château Musar, one of the most written-about wineries in the world. First, begin by talking about historyhow wine making in Lebanon is nothing new (the Phoenicians, the Romans, etc.). Then mention how the winery was founded in 1930 by Gaston Hochar in an 18th century castle in Ghazir, 15 miles north of Beirut, and is now run by his sons Serge and Ronald. Next, mention the Lebanon conflict, and talk about harvesting grapes amid gunfire and shelling. Then talk about where the grapes are grown, at an altitude of 1000 m in the Bekaa Valley, and why this is ideal for viticulture. Finally, when it comes to the wines, be effusively flattering. It's been done before hundreds of times, and you'll be relieved to know I'm not about to repeat this formula here (for those unfamiliar with Musar, you can get the background story from www.chateaumusar.com). This all may seem a little mean spirited. After all, darling of the wine media Serge Hochar has created a legend in Château Musar. These are truly fascinating wines, and I like them. But I would be doing readers a disservice if I didn't mention that there are by conventional standards rather unusual. To my palate the most commonly encountered quirk (I've avoided using the term 'fault'; I don't think its appropriate here) is volatile acidity, perhaps with something strange going on microbially in the background. That doesn't mean I think they are bad wines. I have bought them in the past, and will buy them again in the future. But they are different, and some of their character is almost certainly imparted by the winemaking techniques. Let me use a footballing analogy to explain what I mean. I support Manchester City. They are in many ways a flawed side, but I put up with their failings for two reasons. First of all, they're an interesting team to support; there's hardly ever a dull season. Secondly, and more fundamentally, I just support them. I couldn't change even if I wanted to. I think it's a bit like this with the wines of Château Musar. They're quirky, but they are always interesting, have a loyal following, the prices aren't too high and they have a remarkable capacity for ageing. Just while I'm at it, I'll add a second gripe. From time to time you see these wines described in the press as Bordeaux-like, or even Burgundy like. They aren't. At all. They're simply unique. The white wine is an oddity, made from the indigenous Obaideh and Merwah grapes and aged for six months in oak. It is supposed to live for ever; apparently the 1969 and 1975 are still doing well. Not a lot of this is produced; typically 600 or so cases. But the red is the wine that we know and love. It's a blend, predominantly of Cinsault and Cabernet Sauvignon, although often with a bit of Carignan and Syrah, and sometime even some Mourvèdre and Merlot. This is aged for two years in Nevers (French) oak barrels, and then released about five years after the vintage. With regard to vintages, the Lebanon has had a troubled recent history, and this has affected the wines in that none was produced in 1976 and 1984. 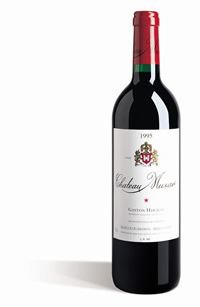 The conflict stopped in 1990, but in 1992 none of the red Château Musar was produced because it was a weak vintage, and the wine was declassified. For purchasing, you'll probably find all the vintages from 1993-1996 for sale at the moment. From these, I'd choose any of the superb 1994, 1995 and 1996. They're each different in style, and which you prefer will probably depend on your palate. Prices should be around £12, and as such I reckon Musar is relatively undervalued for a wine that has such a good track record. I wouldn't be surprised if we see some substantial price hikes in the next year or two, which would be a shame.